I like some kinds of spicy food, such as things with wasabi (a powerful horseradish-esque garnish) and kimchi (Korean spicy pickled veggies), but when incorporated into snacks in Japan, such as kakipi, these spicy tastes get toned way down, to a bland, pedestrian level. So this evening at the convenience store I saw a corn-chip snack with packaging that lent the feeling of “spicy” (as you can see at right), I didn't pay much attention to what was written on it and threw it into my shopping basket. I should have paid attention. 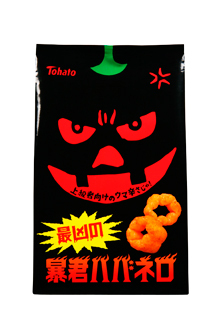 The name of the product is boukun habanero (暴君ハバネロ) and translates to “tyrant habanero”. I guess having paid attention wouldn't have mattered because I didn't know what a habanero is, but according to Wikipedia it's 12 to 140 times more spicy than jalapeno, approaching the level of “law-enforcement grade pepper spray”. Anyway, oblivious to all that earlier this evening, happy to be over my colds and to have gotten my taxes finally finished, I cracked open a beer and opened the bag and started munching. To my surprise, they were not bland nor pedestrian, but really freakin' spicy!. Perhaps more hot than what I might normally like, but encouraged to find a tangy snack, I continued munching. Once I regained my sight and motor coordination, I looked at the package more carefully. I had to look up one of the characters in the yellow star-burst phrase over the product name.... the phrase means “most evil”. No kidding! 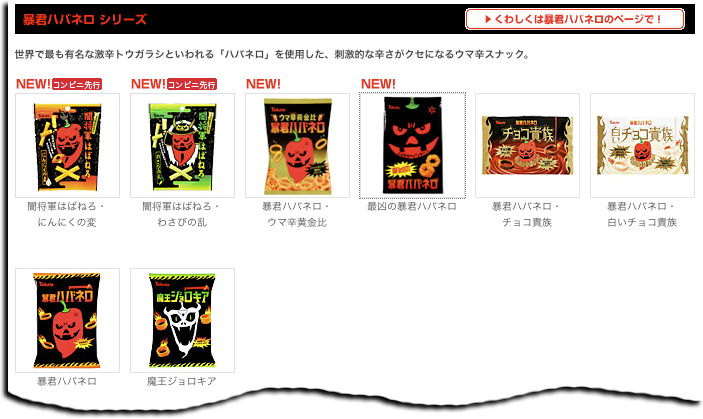 Notice how all the other products have images of cute friendly peppers on them (even the two spicy chocolate bars). They're really really really spicy, but kid's play compared to the pure evil of “most evil”. I'd never heard of this line of products before, but it has its own web site, its own blog, and even its own movie. This was definitely the most memorable snacking experience since the garlic snack of death four years ago. In the end the spice inferno was only superficial... the vanilla ice cream took care of it in short order. Then I finished my beer. I was already laughing pretty hard until I tried (hard to read when convulsing…) to read the garlic post… People walking by my office door must have thought I was having a seizure… Thanks for a great Monday morning intervention! I hate to tell you this, but Habaneros can hurt you twice. In a few hours, you may have to revise that part about the inferno in the end being only superficial. You also may want to keep a supply of vanilla ice cream in the bathroom. And try not to catch the toilet paper on fire. That’s fantastic! We have those same snacks here in Amami also. My daughter Jade, like me, loves spicy food and snacks. Her favorite dish is tacos and her favorite snack is tortilla chips and salsa. These, by far, are the spiciest snacks I’ve ever come across so far. I try out any snack that looks spicy at least once. Most are spicy enough but nothing compares to these. Once in a while, my daughter will get a bag of these but will only eat a couple at a time and save the rest. Have you ever tried the potato chips called Karamucho? Those aren’t half bad. I let my daughter eat those. They have different kinds also. Here is a website for these snacks. Karamucho are pretty much found in any supermarket or convenience store so I imagine you have tried them. So funny ! Yes, the Habanero are super hot. These cute little orange chilis are dangerous. You can find them at mexican produce store. Watch out if you slice them, the oil on your fingers can be hot for your eyes too..
Actually they were selling fresh habanero in a shop near my home. Since Shanthi likes spicy stuff we bought it, and I wanted to taste it, raw. But I knew about habanero so I carefully cut a part of the outer surface and ate it, it was like cucumber, so with the initial fears gone, and thinking that its a Japanese (no spicy) version, I through a piece of it in my mouth, and after that I was in pain for a solid 30 minutes. Water oozing from the place where habanero came in contact with my tongue. God, I thought it could kill someone. Thanks for the water tip, as I was trying to douse the pain with cold water, and the pain never subsided. BTW, Boukun is Shanthi’s favorite, and she thinks that its the ONLY EDIBLE snack sold in Japan. This happened to me last year with some Thai food. I’ve been working my way up on eating spicy things. So I ordered my food at the highest level of spiciness. At first it was really hot, but not too bad. After a little while I was in tears (involuntarily) and I informed my wife that it would probably be a good idea if I didn’t kiss her for a while lest some of the pepper make its way to her lips. I got a surprise package of these chips about a month ago, but was intimidated based not only on Jeffrey’s report, but the packaging itself. I read zero Japanese, but the graphic on the side said it all, with an evil-lloking pepper and two scales of heat: normal “hot” and these chips. I finally worked up the courage and tried them yesterday. WOW! They’re really good. Terrific flavor and a good hint of spice. I finished about 3/4 bag with my ham sandwich at lunch yesterday. Very tasty. The first one is the best. Good flavor (lots of meaty-tasting yeast extract would be my guess) and only minor heat for about 10 seconds. That’s when your tongue goes into orange alert and then the back of your throat. Amazing stuff. The heat lingers for about 35 minutes until the endorphins arrive to take the edge off. They’re hot, but not intolerably so. There’s some pain, but it’s a good pain. I brought a bag into the office today in case any of my co-workers wanted to try (I warned them of the heat level). Only one guy was game. He tried one chip and that was plenty for him. The others passed based on his reaction. This is good news. More for me! The fact that the chips themselves look like small Habanero rings is a bonus.